Ald. 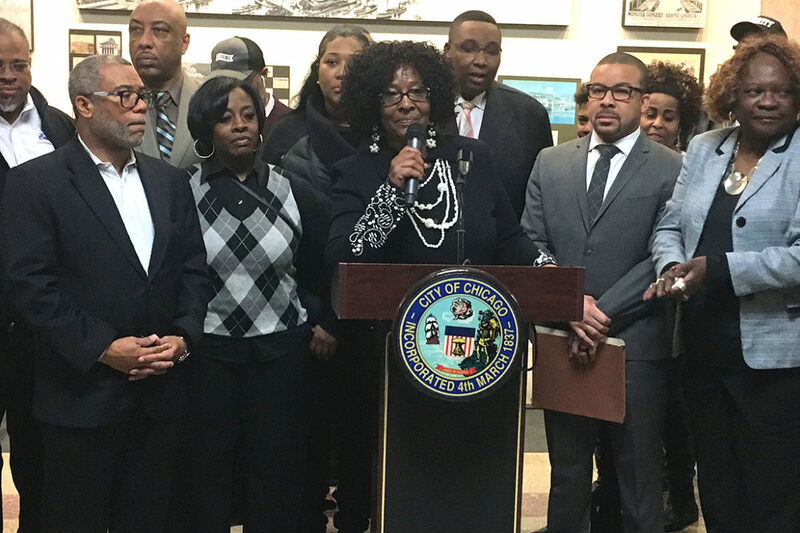 Emma Mitts (37th) hosts a press conference on Jan. 23, 2019, with business leaders and fellow aldermen to laud the construction of the police and fire training academy in her West Side ward. Update, March 13, 2019: Chicago City Council voted 38-8 today to approve the $85 million AECOM contract and also approved a bond issuance that includes $65 million to fund the construction of the police and fire academy. The city’s pick to design and build the controversial police and fire training academy in West Garfield Park is a multinational engineering and design firm with a history of fraud and waste, especially on publicly-funded projects. On Wednesday, Mayor Rahm Emanuel introduced an ordinance that would grant the contract to design, develop and build the $85 million cop academy project to a venture led by Los Angeles-based AECOM. The deal still needs to be approved by the zoning and budget committees and then the full City Council. The police and fire training academy has already faced intense opposition from community activists and has become an issue in the mayoral race. Five candidates for mayor — Amara Enyia, LaShawn Ford, Lori Lightfoot, Toni Preckwinkle, and Willie Wilson — promised, if elected, to call for City Council to halt the cop academy at a mid-January forum organized by progressive groups. AECOM is a $20-billion-a-year company that has worked on several major Chicago projects, including the O’Hare modernization project, the I-55/Lake Shore Drive Interchange and the 31st Street Harbor. Last year, the company scored a $41.5 million contract to build the Department of Fleet and Facility Management’s new headquarters in Englewood. URS, an AECOM subsidiary, and Bechtel National used “deficient material” in their work on a nuclear weapons facility in Washington State. AECOM paid the U.S. Department of Energy $57.5 million in November 2016 to settle the claims, but denied wrongdoing. Another URS subsidiary, Washington Group International, later paid a $5.275 million fine to the DOE for filing false overtime claims on a separate contract related to the cleanup of nuclear waste at the same site. Tishman Construction, an AECOM subsidiary, was charged by federal prosecutors in New York for fraudulently billing clients on construction projects for time that workers never actually worked. The charges alleged a scheme of overbilling that stretched for more than a decade, before the construction firm was acquired by AECOM, and included work done on One World Trade Center and the Plaza Hotel in New York. The company agreed to pay $20.2 million in December 2016 to avoid prosecution. AECOM was selected to design and project-manage the construction of a “state-of-the-art” 2,000-bed jail in Detroit. But less than two years after breaking ground, the project was halted due to allegations of corruption in the contracting process and $100 million in cost overruns. AECOM and its partner on the project paid Wayne County $2.5 million in 2016 to settle a lawsuit and provide plans so the project could be completed by a new contractor. AECOM’s Australian unit paid the U.S. equivalent of $201 million in 2015 to settle claims that it inflated traffic projections for construction of a large toll road in Brisbane. In 2009, the Special Inspector General for Iraq Reconstruction found that AECOM had overcharged the U.S. government up to $4.2 million as part of a contract to provide support and maintenance for the Iraqi Army. For example, AECOM had charged $196.50 for a package of 10 common hardware washers, even though the actual price was only $1.22. The company said it paid back more than $4 million, but their receipts raised more questions than answers, according to the inspector general. A spokeswoman for the mayor’s office said in a statement that AECOM was considered the “most qualified” candidate after a year-long proposal process. “They have extensive experience delivering design-build projects both locally and internationally and experience with comparable public safety projects. They have compiled a strong team that includes 14 sub-consultants, including nine registered as MBEs and three registered as a WBEs,” the statement said. The selection of AECOM may not come as a surprise, given the firm’s and its partners’ Chicago connections— what’s long been known here as clout. Denise Casalino, AECOM’s senior vice president for the Chicago region, was the commissioner of planning and development under Mayor Richard J. Daley. She resigned in October 2005 amid questions about whether she meddled in the approval of permits for a real estate project her husband’s development firm was involved with, the Tribune reported at the time. She started working at AECOM the following month, according to her LinkedIn page. Another top AECOM official in Chicago, Bill Abolt, also worked for the city under Mayor Richard M. Daley. Abolt was Daley’s budget director until he resigned in 2004 amid the “hired truck” scandal. Before that, Abolt was commissioner of the city’s Department of Environment and David Reynolds, now the commissioner of the Department of Facility and Fleet Management, worker under him as a deputy commissioner. Between his first tenure with the city, which ended in 2004, and his current one, which started in 2011, Reynolds worked for three years as a Senior Vice President at AECOM, according to his LinkedIn profile. The former CEO of Tishman Construction, Daniel R. Tishman, who sits on the AECOM board of directors, gave $50,000 to Rahm Emanuel’s re-election campaign in 2015. AECOM’s political action committee has also contributed to other key political figures, according to campaign finance records. Cook County board president and mayoral candidate Toni Preckwinkle has received $2,200 from AECOM and embattled Ald. Ed Burke has received $1,500, half of which came just two weeks before his offices were raided by the FBI in an extortion investigation. The company has also donated $4,500 to Metropolitan Water Reclamation District Commissioner Barbara McGowan, who appeared with aldermen at a press conference on Wednesday to support the project. Tishman Construction received a contract in 2009 to renovate several Chicago Public Schools worth nearly $30 million over three years. For diversity and compliance consulting, AECOM hired a firm owned by Ernest R. Sawyer, uncle of Ald. Roderick Sawyer (6th) and brother of former Mayor Eugene Sawyer. His firm was also retained by the Obama Foundation for the Obama Presidential Center. Two other partners on the project also have political connections and have made significant political donations. Berglund Construction and its president, Fred Berglund, have given more than $13,000 to city and county officials since 2015. That includes $3,400 to Ald. Michelle Harris and her 8th Ward Democratic committee, $1,625 to Ald. Leslie Hairston (5th), and $1,500 to Toni Preckwinkle’s campaign for Cook County board president. Berglund backed Gery Chico in the current mayoral race with a $1,000 donation in September. Another partner is BOWA Group, a minority-owned construction firm that has worked on projects at O’Hare and Midway airports as well as the Chicago Housing Authority’s Lathrop Homes redevelopment. The company and its president and CEO, Nosa Ehimwenman, have donated more than $25,000 to city and county committees, mainly members of the aldermanic black caucus, since 2014. That includes $3,300 to Hairston, $3,250 to Sophia King (4th), $2,000 to Jason Ervin’s 28th Ward Democratic organization, and $1,000 earlier this month to Chicago Intellect PAC, a political action committee run by Ald. Walter Burnett’s wife, Darlena Williams-Burnett. The PAC, which was created in September, has not yet made any political donations but has more than $50,000 cash on hand, according to Reform for Illinois. 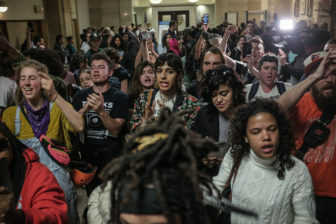 Youth organizers who have been fighting the idea of the police academy from the start said the selection of AECOM was further proof that a $95 million cop academy is a poor investment. McCullom, 16, a sophomore at Kenwood Academy, said the money would be better spent on schools, health care, and community centers. But Ald. Emma Mitts, whose 37th ward is home to the planned police and fire training academy, said Wednesday morning that she wasn’t concerned about AECOM’s work on projects in other cities. Mitts was joined at a press conference by aldermen Burnett (27th), Jason Ervin (28th), and Michael Scott Jr. (24th), all of whom lauded the project and the jobs they said it would bring to their West Side wards. Mitts said she trusted the selection process, conducted by the Chicago Infrastructure Trust — a private, nonprofit agency created by the mayor to help leverage private financing for large city projects. She pledged to make sure the community knows if the project goes over budget and why. Correction: An earlier version of this article misstated the amount of the police and fire training academy contract. It is $85 million, not $95 million. Correction: An earlier version of this article stated that AECOM refunded the City of Chicago nearly $200,000 in October 2018 for design work that a subsidiary had done on an L station more than a decade earlier. At the time, a spokesman for the city’s Department of Transportation said he could not explain the apparent refund, but also did not dispute that it was a refund. Since the story was published, the department has provided documentation to show that the money was not, in fact, refunded, but rather was released from the project because it had not been spent.